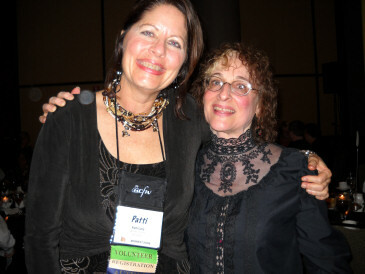 Debra here, and I'm happy to welcome our guest blogger Patti Lacy (who feels more like family than guest!). Patti is visiting on Fiction Day with a little insight for readers, and a question for writers--Come back tomorrow when she shares about faith! It Takes A Village…to Find a Rhythm. Hello, Inkies! It’s wonderful to be back at the well. Lately blog appearance requests and scripts for radio shows fill my “in” box. I tackle them, one by one. What’s the title? The Rhythm of Secrets. My fingers fly over the keyboard. So far, the standard blog questions. I’ll nail this baby before coffee-time! I look at the next line. How long have you been working on The Rhythm of Secrets? I pause. Stare. Shake my head. Google the names Sandy Sperrazza and Gail Rosenblum, whose Chicago Tribune article back in two thousand and seven caused me to slosh coffee all over the morning paper and not even care. A mother, giving away her baby. Having the span of time it takes for a cab to leave the hospital and return to a Home for Unwed Mothers (an eternity, a blink) with that child. Kregel, who bought a “risky” time period (the 1960s, though the backstory stretches back to the 1940s). Some consider the Vietnam era too early for contemporary, too late for historicals. Sandy Sperrazza, who shared the pain, the loneliness, the shame she carried along with that little baby and was willing to let me capture it on paper. Two Vietnam War vets who pulled out old ammo cases and slang and photos and uniforms and memories to help me set the nasty stage of anguished and hurting men on leave over in Bangkok. A Thai national who drove seedy streets, his camcorder in hand, to capture on tape the more public (but no less shocking) aspects of the Bangkok red light district just so I could SEE it. Did I mention his wife, father, and little daughter accompanied him? New Orleans octogenarians, including one tour guide who knows more about 1940s New Orleans than I know about my street here in Normal, Illinois! A Master Gardner in New Orleans, who helped me feel the damp soil and see the curling vines of an old Victory Garden. Who else helped me? Two firemen. My doctor. A Normal Police Department lieutenant. A shelf of books whose authors placed me in the teeming Quarter, in a Thai brothel and also in the lush Thai countryside, in a mid-20th-century home for unwed mothers. It takes a village to raise up an author. And a whole lotta time. I haven’t mentioned crit partners, the great Kregel editors, Cat in marketing, prayer partners, a supporting cast of family and friends. AND DON’T FORGET THE READERS!!!!! Writer friends that infect me with the green skin disease of jealousy open their hearts, and books pour out, sometimes in months. For me, it seems to take a village. And a year or three! Readers, did you realize how much went into a book? Writers, how long does the process, from idea to inking your name on the inside cover, take YOU? The Inkies love Patti-- She's a warm, caring, and beautiful friend with an incredible heart for God. If you'd like to find out more about Patti, her books, and her faith, visit her at her website. I'll be reviewing The Rhythm of Secrets on Saturday February 12th. Thank you, Patti and thank you followers and visitors! Stay warm and safe! I had the opportunity to read The Rhythm of Secrets before it went to the publisher and I loved it enough to devour it over a two day period even when it was on a computer screen instead of in my hand. Now I get to read it again, with book in hand. I love how Patti has tied songs to each chapter...which reminds me. I think Patti is one of those authors who can write to music (with lyrics). When I try that I end up writing the word that I'm singing in my head instead of the word I'm saying in my head! Tabitha, wherever you are today I hope your travels will be safe. Hey, Tab. You kept me up LATE last night reading your great stuff!! I'm huddled around a space heater, coffee cup safely in reach, and thinking of you DOWN UNDER!!! So yeah, Deb, at least meterologically, our Tab is safe!!! Deb, thanks for having me at the well. I wrote earlier, but apparently my comments didn't save. Precaffeine, no doubt!!! A "Chance" as in, we aren't running any illegal gaming here in Inktropolis nor do any of us make money or acquire anything in return for our services type of giveaway? So, Patti and Tabitha...are you telling me Tabitha is in summer while we are wintering because I understand things are not safe in the weather department DOWN UNDER either. Oh Deb. I think you forgot to set out breakfast. I'm hugging a large cup of hazelnut coffee and thanking God that we didn't get hit as severely as other places with all that snow. I absolutely love the title. And I love Patti's work. Keep the books coming, and thanks for inspiring the rest of us. Hey Jilly! Must Go Faster. Our lives are at such odds. We must both 'slow down and enjoy' and 'go faster'. That must be true for more people than just you and I. Great to see you here. Food. I try not to think of food while in Inktropolis, Jill. "It's my one true weakness." I need to keep my fingers dry and my keyboard already suffers from too many toast crumbs! But for you and Patti, I'll make an exception! Teresa, would you like your name in the hat (we'll use a top hat today in honor of Punxatawney Phil) for the 'chance' giveaway? Y'all are SO FUNNY at an hour Punxatawney Phil would consider heathen!!! Teresa, THANK YOU for being a true-blue radar--quit it, silly fingers--and a true-blue reader, too! Deb, LOVE having you hang with. Sigh. I am reviewing the most fascinating manuscript this a.m. and hope to wrap up my own proposal. C ya in a bit! so i Googled your book inspiration and almost cried reading the article. i'm an adoptee who found her birth parents at the age of 30. i'm now 42 and having my birth mom with her two children in my life these past twelve years has been awesome. i stay in contact with my birth father as well (with his nine children). i have to say for me, finding my birth parents was extremely healing, although i'm not as sure about how it affected them. perhaps i will ask them the next time i phone them. i do know they were both extremely happy that i found them. my birth mom couldn't wait to speak to me and my birth father's first words to me were "what took you so long?" that said, i know that being adopted was what the Lord had planned for me and what was best. wow... i'll have to check out the book. i'll probably cry all the way through it. Oh, DEB!!!! I've had a couple of letters every bit as poignant as yours and would LOVE your input. Deb, um, this story doesn't stray far from my front door, either. Do you know that of my four books (including the Bethany House fall release), THREE cover adoption in a BIG WAY??? I would be so blessed if you would gather a big breath, a big bundle of courage, and read. Then let me know if I got it right. Thank you for cutting open your heart and letting us experience not only the pain but the beauty. and let us know if you're interested and give us your contact information so we can put you in the drawing. Thank you for your story. Patti's book is incredible but I can't imagine being in your situation and reading it. Wow. I'm almost in the middle of this book and the story is gripping! I'm always amazed at the people who will jump in and help a crazy novelist. (Speaking more of myself as crazy than you, Patti! LOL!) And aren't we so glad they do, for it is impossible to be an expert on every point that comes up in a story. I am very excited to read The Rhythm of Secrets. Your writing ALWAYS grips me, Patti. It pulls me in and makes me wish I didn't have to leave. And I read it again in a few months. Sometimes for inspiration. Sometimes because I just want to be with the characters again.And again. I recently won your book over at Jennifer Shirk's blog - Me, Myself, and I - and I can't wait to read it. WOW, Patti, I never realized all that went into The Rhythm of Secrets, but I should have because it's one of the most amazing books I have ever read. Needless to say, Patti, with all that you pour into a book -- exhaustive research, great effort and remarkable skill, you are my hero, kiddo. Anne, you're zipping right through the thing! Just think, your village effort'll be out there soon! Robyn, glad to have a comrade-in-arms re longeivity!!! I appreciate your commitment! Oh, dear Julie. You are definitelyl an alderwoman in that village. What would I DO WITHOUT YOU???? Debra, thank you for this wonderful post and inspiring conversation with Patti and the gang! I just received this book in the mail a few days ago and can't wait to get to it. Patti is definitely one of those people who write life changing books about important issues. Actually, to further extend our Patti Lacy festivities, I'll be blogging about her wonderful novel, What the Bayou Saw, in a few weeks to honor Black History Month. As for me. My first novel started percolating in 2001. For years I read and watched everything I could find on the middle ages. I even got to teach some Medieval lit. I started writing in 2006 and just did a major re-write in fall 2010. Okay, that one's overkill and largely served as a learning process, but I would say from inception to completion books do take me a few years. Soon, I hope to start working on some ideas that first came to me over a year ago. Cheryl, what would I do WITHOUT YOU? Another villager. Perhaps...okay, Cheryl. I don't do this often. What role would you like? Dina, that means so much that you are drawn to those life-changing issues. Thank you for that comment. PR woman? WRITER, TOO, of course. I love the title too, Patti. It's so evocative. And the whole story just sounds like something really...cathartic. Can't wait to lay my hands on a copy! Reviews are everywhere. Cheryl, do you have decaf, I'll be right over! Lisa!!!! I think of you often. To ME you are a calming presence, a reminder of why we do what we do!!! Deb, I'll bet you spent every bit as much time on research as you did for "Man From Macedonia." Folks, if y'all love the Civil Rights era, Deep South books, THIS IS THE ONE FOR YOU!!! I feel so strongly about this book, I endorsed it!!! Reading an equally evocative one now, "The Warmth of Other Suns." Um, by Isabel Wilkerson, winner of, um, only a Pulitzer. I love being here at the Inkwell and notice y'all have two new faces. CAN'T WAIT TO MEET 'EM!!! VERY COOL! Decaf Deb? You bet. Scone? i didn't realize there was a giveaway going, i just was impressed with the content of today's blog. Cheryl. Scone -yes. I'm craving them and today I have no willpower. Patti is so full of energy and God's Spirit. I just love to learn from her. I know it takes a lot to write a book, and even more so to make that book GOOD! Can't wait to get a hold of your book, Patti! Deb's nice enough to call it secrets when it is flat-out disorganized!!! Definitely a book, though after shoveling snow for an hour, N'Awlins is soundin' pretty good!!! Fascinating Patti - I especially enjoyed the list of people that helped you - I'm really impressed with all the research you did! Gee, I almost fell off my chair when Deb teased us about a trip to N'Awlins. Although I'm not adopted, I was separated from my birth father from the age of 6 until I searched him out at 16. His first words to me were, "I never thought I'd see you again." This is a powerful book. It's been almost a year or so since I beta-read my copy and a week doesn't go by when something in it comes to mind. Great job, Patti and Deb. You had a wonderful team supportint you, and it shows. Everyone who critiques, reads, encourages, adds some useful tidbit, or helps with research has an important part in bringing a book to life. Lots of Debs here today. I'm used to that. Thank you Anita Mae for making the book trailer easier to get to! I think it's amazing how you take real stories ,Patti, and build your books on them because it's got to be such an emotional experience for your collaborator and you! JGH, thanks for stopping by! Anita Mae, see you are another villager. Wait! So are all the Inkies!! Even tho' most of 'em don't write with lyric-driven music. Poor souls. We will have to enact a law in our village. Deb, thank you. The trend should continue through Books 5 and 6!!! I'll draw a name on Saturday afternoon and email the winner. For those of you who haven't read a Patti Lacy book yet, you don't know what you're missing! And for those who have, I KNOW you want to get your hands on The Rhythm of Secrets. It's another great tale from a master storyteller. You know, it's amazing, really, how long we writers can keep things simmering. I have a book full of notes for books I want to write and snippets of ideas. Some of them are pretty old, but a lot of them are still great book fodder. Oh, Patti, it's so great to see you here. I love the cover of your book, and it sounds wonderful. I can't wait to read it. That's it! Cannot wait one more minute. Off to Amazon to buy Rhythm. Debra, thank you for hosting today! Or mayor. Yeah, definitely politics. Suzie, good to see YOU, too!!! How is your trip? Was? Or have you not left yet? Well, Rosslyn, I guess this blog hopping worked! The winner of Patti's book is Deb H.
Thank you Patti, and to all our wonderful visitors this week to celebrate Patti's book!